Dynamic, responsive forms and application portals. Workflows and custom actions that automate operations. Reports and dashboards that improve decision making. Leading-edge technology for SharePoint and Office 365. Turn SharePoint and Office 365 into powerful platforms that streamline business processes — reduce costs, improve service levels, and increase efficiency. Make your organization more successful and your job easier! Available on SharePoint 2013, 2016, 2019, or Office 365/SharePoint Online, our applications are 100% native to the appropriate platform. Developed and fully supported by Crow Canyon — no third-party tools or add-ins. They are 100% customizable with no coding to provide maximum flexibility and ease-of-use. Create your own solutions. Replace InfoPath and other legacy programs. Our unique NITRO Studio™ powers up SharePoint and Office 365 applications to provide the functionality your organization needs to be successful in today’s changing work world. Developed and supported entirely by Crow Canyon, NITRO Studio provides the underlying foundation for applications and custom development projects. 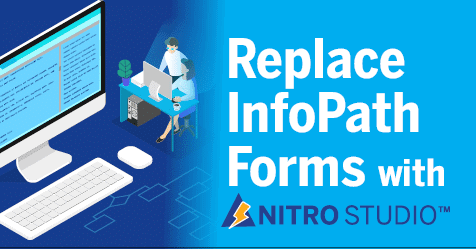 NITRO™ delivers the critical components — forms, portals, workflows, approvals, alerting, routing, database integration, and much more — that make SharePoint and Office 365 robust and effective platforms for managing business automation. If you already use SharePoint or Office 365, then you understand the potential for increased productivity, application integration, and collaboration that these platforms bring. Now take the next step to realize the full potential of these platforms by using Crow Canyon’s applications and custom development expertise! Find out more about Crow Canyon Software. We write blog articles, host webinars, sponsor events, post videos, research white papers — all with the goal of providing the information you need to achieve your goals. Give us a call, send an email, or meet us in person at one of the many shows we attend.